Yoga: What is it? What type of yoga suits me? From a beginner to a more experienced yogi, we have a class to suit you. We recommend that you start with any of our Beginner classes and progress into our General classes. Do try our different teachers as they all teach the same style and method but from their own personal journey. We have classes for Beginners, classes for Men to begin with, General classes and also Hatha Ropes Yoga. Alternatively if you are unsure and wish for some advice please contact us. Yoga is a great form of exercise but also so much more. It can help you begin on a real inward journey and help you to create a lot more body/mind awareness. Yoga can really help us feel better about ourselves. Passed down from generation to generation for at least 4,000 years, possibly even more, it's record is proven. Yoga can give you health and wellness, fitness and a great sense of peace and well-being from the inside-out. Yoga can be just a physical exercise... stretching, breathing, but can also be much more. Yoga belongs to no particular faith or religion. It helps to restore balance and harmony between the body and the mind. Yoga is for everybody and you don't need to be young, flexible or slim or a vegetarian to enjoy it! Yoga can really give us wonderful results. Yoga will suit any age, body shape or stage in your life. Most people start Yoga with the physical postures. They begin coming to class and then begin to feel so much better and often then become more interested in the other philosophies and principles of Yoga. Yama – Moral principles related to society. So if somebody lives a balanced and harmonious life in society, they are also practising one part of Yoga. Niyama – Personal principles, such as what to eat, when to eat, when to sleep, cleanliness, truthfulness and much more. Asana – Physical postures to enhance the energy flow through our body's meridians (Nadis.) Asanas help to strengthen the physical body keeping us strong, flexible, balanced and healthy. Pranayama – Breathing exercises which help to regulate the mind and our energy flow. Pratyahara – By drawing our senses inwards we start to gain control of the mind. The mind constantly flows to the external world through the five senses Sight, Hearing, Touch, Smell and Taste. 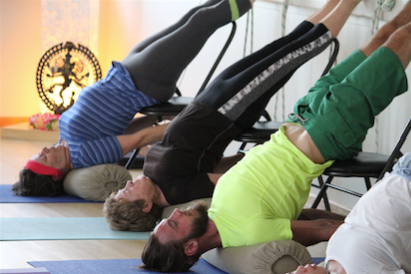 In Pratyahara we move inwards and away from the reactions caused through the senses. Dharana – Concentrating internally is where meditation begins. Dhyana – Meditation. Observing what is happening and changes taking place. Samadhi – A thoughtless state which is beyond the mind. Sometimes called enlightenment or a state of increased awareness or bliss. Yama, Niyama and Asanas are on the physical level. Pranayama and Pratyahara are in the mind level. Dharana, Dhyana and Samadhi are beyond the mind. Take some time for YOU. Time to breathe, relax, gain flexibility, and create strength and energy. Let the path of Yoga create space in your body and mind. We look forward to welcoming you soon.